Business Register is the most important eGovernance solution offering e-services to a huge number of people online at any moment daytime. Thousands of employees from banks up to law enforcement, or just citizens, use on-line services of the Business Register. If you need to find a business-partner, to check a company’s income report or credibility, to confirm a role of a chairman or a shareholder or to find links between people through companies – the Business Register allows doing this at any moment of the day. 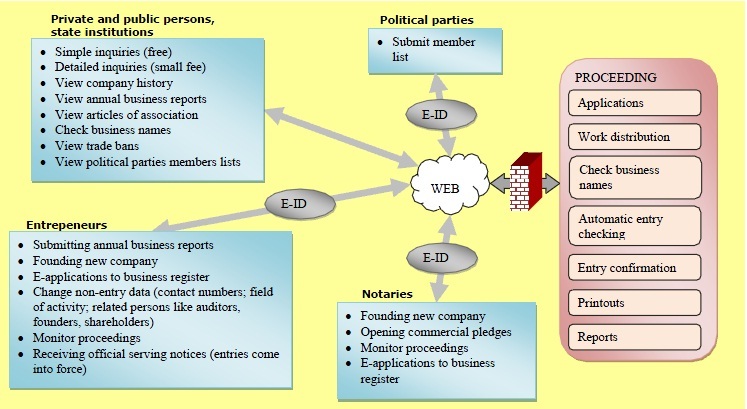 The system contains unique, adequate and actual information on entities (companies, foundations, non-profit organizations, political parties, entrepreneurs, management, owners, founders, procurators, members of the parties, etc. ), and different procedures (any changes or events) and guarantees the availability of data at any moment for any user of the system (globally or inside the organization). Business Register of the kind was implemented in 1997, first in Estonia. information is public and everybody can access in web.